A couple of years ago, my daughter had the good fortune of marrying a young man from Antwerp, Belgium. They live near us in Lakewood, so I try, at least, to make him some of the delicacies that he is accustomed to back home. 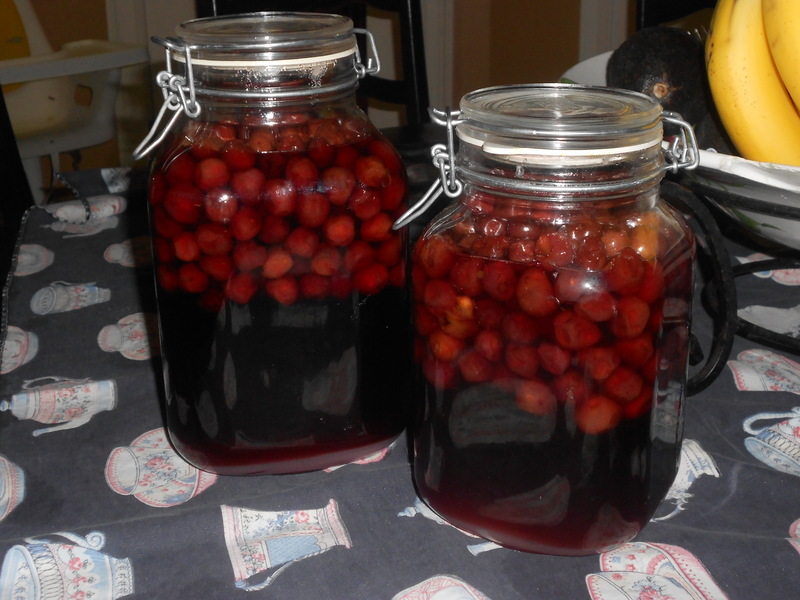 When my daughter returned from a visit to Antwerp while she was engaged, all she did was rave about the delicious alcohol-preserved cherries that her future Mother-in-Law made. Each Spring, Rita preserves jars and jars of sour cherries in alcohol and spoons it over compote, pound cake, or ice cream to pump up the flavor of the dessert a few notches . In essence, she makes a very delicious cherry liquor, which is months in the making. It sounded easy and intriguing (albeit not instant), and my dear Machatenista, Rita, promised that before she returned back home after the June wedding, she would make a batch of the cherries with me. I bought a large glass jar with a clamp and rubber seal. Although it is hard to find sour cherries in my area, a neighbor of mine found a place to pick them right off the tree, in Battleview Orchards in Freehold, NJ. The sour cherry season lasts from the end of June till the end of July, and I picked a nice amount of sour cherries, picture perfect, off the trees. 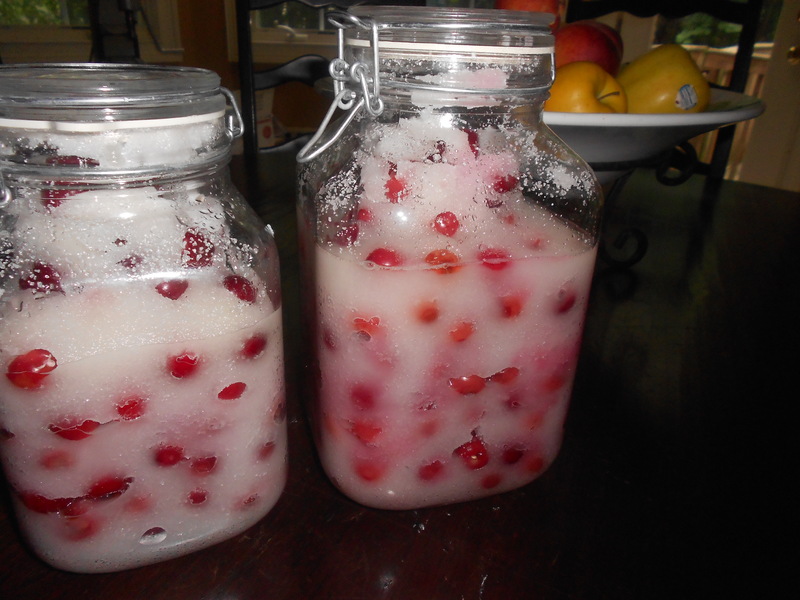 After 2 or 3 weeks, the sugar had melted into a syrup and the cherries had shrunk so that the cherrries with the sugar syrup only filled 1/2 or 2/3 of the jar. Rita had long since gone home, but we called and emailed and she determined that it was time to add the alcohol. She uses 95% alcohol which is available in liquor stores and she told me to “just pour”. I poured a couple of “inches” of alcohol into the jar and added some cherry liquor (you can use Kirsch or Cherry Herring) to that. 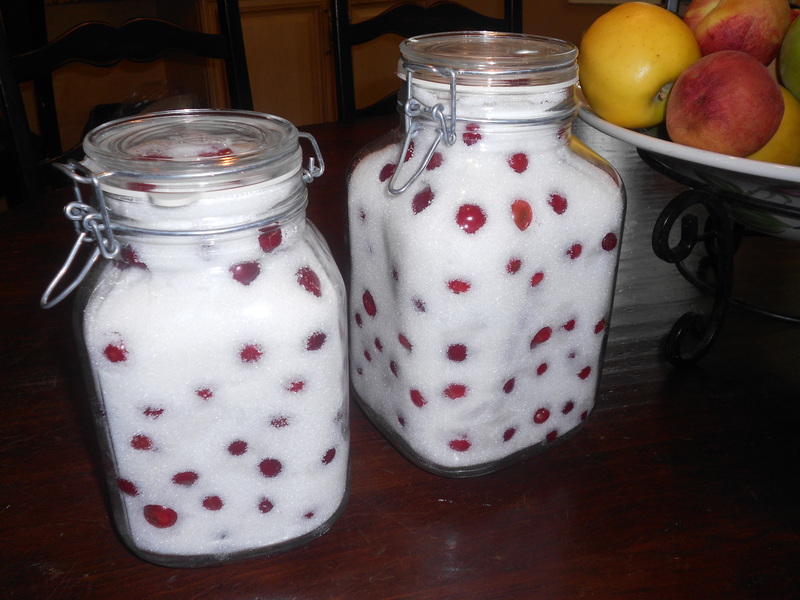 Then I resealed the jars, covered with the towel and let it sit, this time for a few months. I still opened the jars periodically to taste and release the gases. By October or November, the cherries were delicious and ready. A couple of months later, when Rita was back, she tasted my cherries and determined that they could use a bit more alcohol. So we added more at this point and enjoyed them until the next years batch was ready! I have tried to make this with regular cherries and I must say that the sour cherries, although smaller in size were much softer and tastier without being too strong. It has become a specialty in our home and we serve these preserved cherries for dessert all year round by spooning it over cake, ice cream, whipped cream, cheesecake, mousse, soft puddings or any desserts that need a lift! Any leftover cherries (not fitting into the jar) can be pitted and frozen for another use such as a cherry pie or puff pastry turnovers. 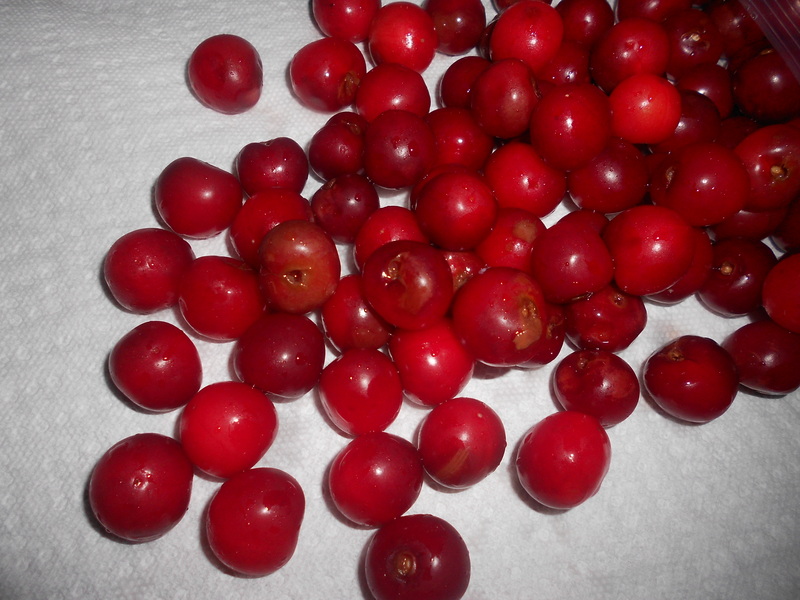 This picture is what the cherrries look like after macerating for 1 week. My daughter has just shown her mother-in-law her cherries via Skype! Rita has determined that the sugar has sufficiently melted into a liquid and it is time to add the alcohol for preservation. Pour enough All-Clear (95% alcohol) to cover cherries and add about 1/2 cup of cherry liquor. Once again, cover with a kitchen towel and put it in a cool, dark place – this time for several months. 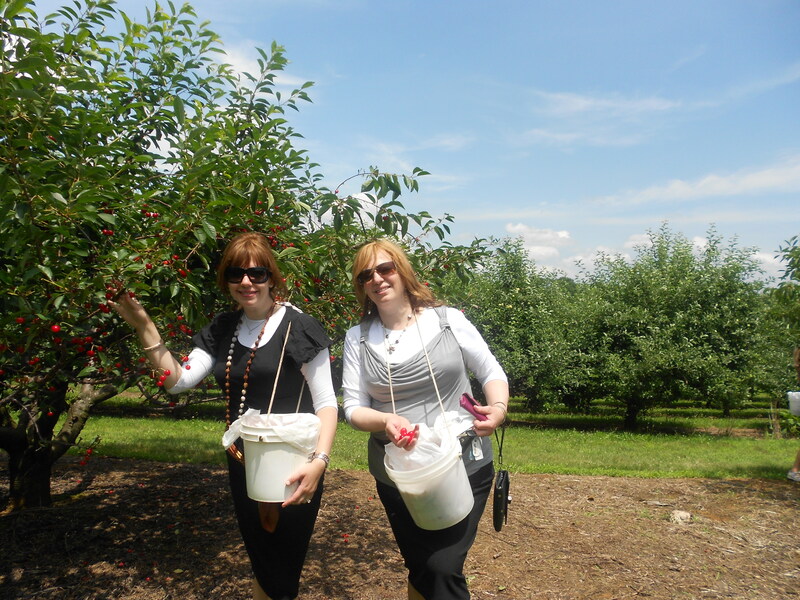 Your cherries should be ready in the Fall! what alcohol did you use? i have a bottle of “rectified spirit”. Is that good? Does it need a hechsher? I use Everclear brand, 95% alcohol. I love your web site, especially the pictures. I made some cherry brandy about two years ago and it was delicious. It brings back memories from back home. I also enjoyed your comments. Maybe your next career should be as a writer. Thank you! Being that you know my mother, and knew my grandmother A”H, you know that the apple doesn’t fall far from the tree (at least in the kitchen)! All the best and a git gebentched yor to you and your family. I just found your blog and really am enjoying it. I also have made cherry liqueur from a recipe from a friend of my mom’s. I posted about it quite some time ago. I am going to link from my post to your post. I used vodka instead of the everclear. My father used toile cherry brandy and I just bought morello cherries (the best come from Iran of all places) and will start the process tonight using the stone jar my grandmother brought to the UK in1910 from Pitrokow Trybunalski. Thank you so much! I wanted to ask if you saw at the begining of the process that the cherry were cover with mold? because i started the process yesterday and today i saw 2 cherries coverd with mold. is it normal? and what can i do to fix it? may be i nedd a colder plece for them? I did once have that with one jar and I threw it out. If you can remove all of the moldy ones and the rest is good, proceed but put them in a cooler place like a basement. thank you. i remove the moldy one and put the jar in the fridge all the week and it look just fine! thank you! the result is fantastic!